SCCCS TIM BUTLER grabs a rebound as teammate Davon Wilson (31) and Gateways Jeffrey Tracey look on during Saturdays game. 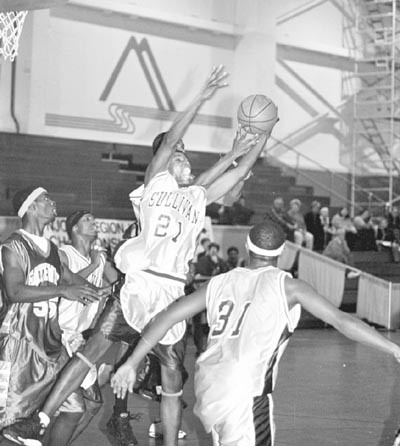 LOCH SHELDRAKE  December 4, 2001  Despite a rather lackluster first half, the Generals of Sullivan County Community College (5-1) apparently got the message from the coaching staff and decided to apply those lessons about the fundamentals in the second half as the hometeam hoopsters defeated the Gateway Community College Lions 83-53. In the first half of Saturdays mens basketball game at Paul Gerry Fieldhouse, the Generals carried a slim eight-point lead (32-24) into the lockerroom. At one stage, the visiting Lions led the home team, a development that visably upset the teams helmsmen and fans. The Generals missed basket after basket and passed the ball into no-mans land in the opening minutes, a performance that caused some consternation among Sullivans Athletic Director Chris DePew and new Coach Chad Beeten as they watched a strong Gateway defense put some real pressure on the home team. In the first half, the Generals top shooters  Shiron Brown and Tim Butler  got into foul trouble early, and were benched until they were needed later in the game. In the second half, Brown racked up 19 of his game-high 21 points to carry the win for the Generals. Beeten said the team was off to a good start. We have a long way to go to be the team we want to be to win the championship, he added quickly, referring to the brass ring at the end of the race for a National Junior College Athletic Association (NJCAA) title at Delhi. Aside from Brown, Generals hoopsters scoring in double digit territory included Dana Holmes (18), Butler (14) and Davon Wilson (14). For Gateway, Arthur Maebry netted a team-high 15 points and Jeffrey Tracey added 10. I thought we were spendid in the first half, but we were flat-footed in the second half, said Gateway Coach John Stewart. If we can keep up the momentum, we can play with anybody, he added. Beeten added that one strategy this season is to mix up the shooting order a bit, focusing on other players to allow the Generals big guns, Brown and Butler, to take game-clinching shots.